Here is a clip of David in Jyotir Math and views from the helicopters flying high up in the Himalayas. An update from David about his trip to Jyotirmath while filming his new documentary. The glories of an off day! David is in Paris, the rest of the film crew has scattered to their homes or work places throughout India, and I have a day off in Mumbai before my flight to JFK at 1:30 am tonight (technically, tomorrow, but who’s counting?). I don’t drink coca cola in the States, but oh, my, when water is suspect and the heat is overbearing, there ain’t nuthin’ like it… and what bug can survive a cold coke? Indian television for a westerner: not so good. I have about ten pounds of dust in my lungs. If I weighed myself that would be confirmed, I am sure. I don’t like haggling over prices. I want to get some gifts to take home, but feel exhausted at the prospect of either (a) dueling over rupees (b) feeling like I just overpaid for something by 1000 percent. My standard joke which drove David and everyone crazy during the trip as we were winding our way through tiny villages: “Hey, I know a good Indian restaurant in the next town.” It was never funny, but that did not dissuade me from ramming it down everyone’s throats, repeatedly. More thanks to my angels of safe travels (and a safe diet). I never got sick. Yay! India is a study in geographical and cultural contrasts, and we experienced it in a compactified way. 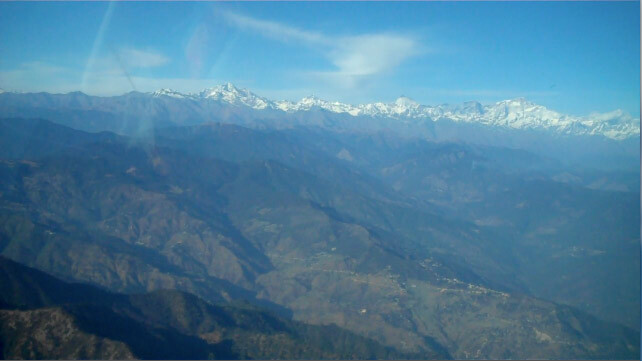 First, we helicoptered north from Delhi into the Himalayas to Uttarkashi and Jyotir Math… Pure, cool (but not yet piercing cold), thin air and an ancient feeling–like the mountains themselves—despite the repeated onslaught of the modern world. Finally, we flew from Delhi through Bangalore to Madurai in the south and then drove to Rameshwaram, Kanyakumari, and Trivendrum… Hot, humid air; more people wear traditional garb of saris and dhotis, and for some reason there are a lot of goats. Delhi is the Chicago O’Hare Airport of India. Basically, to fly anywhere you have to go through Delhi. We went to a lot of places, but one that stands out in my mind: Allahabad University, sitting on wooden benches behind wooden desks in a 100-year-old lecture hall listening to a physics professor speak on Einstein’s theory of relativity. The head of the physics department later told us this is where Maharishi, who attended Allahabad University, would have sat as an undergraduate student studying physics, math, and chemistry. Maharishi always talked science, and it must have been here that he gained his initial understandings of physics and science—an understanding which informed his work over the next 50 or 60 years to bring meditation and consciousness into the scientific mainstream. One of the Indian cameraman traveling with us said that some people in India view gurus as god-like. He asked David if he felt that way about Maharishi. David said he felt that Maharishi had attained the highest level of development for any human being–enlightenment–and that as a meditation teacher, Maharishi had the ability to impart the knowledge so that any human being could do the same thing. So David’s answer was, No. That’s it for now, but more to come. I have a 16-hour (head winds permitting) Air India flight to JFK coming up and I have to meditate and pack and get ready to go. Yikes! 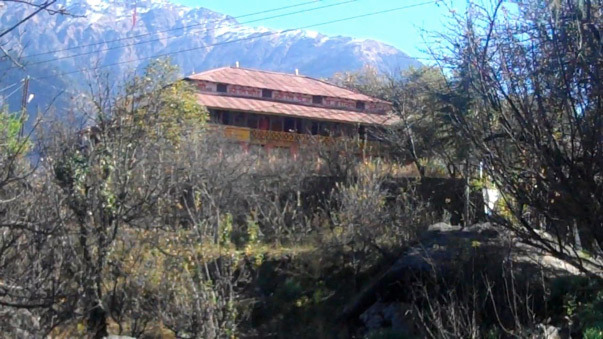 This is the seat of the Shankaracharya of Jyothir Math high in the Himalayas in India, where Maharishi studied with his teacher, Guru Dev, from 1940 to 1953. 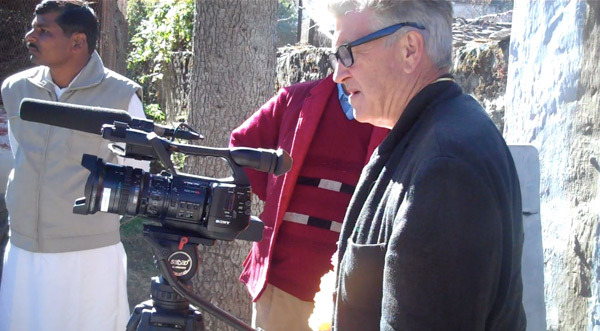 David Lynch is in India right now, starting work on his film on Maharishi Mahesh Yogi–the founder of Transcendental Meditation, David’s first report comes to DLF.TV from high in the Himalayas, in the small town of Uttarkashi, known as the “Valley of the Saints,” where for thousands of years, seekers of truth have gathered to meditate and rise to enlightenment. Maharishi spent two years in silence in Uttarkashi, from 1953 to 1955, following the passing of his teacher, Guru Dev. More reports from David to follow.